You have no doubt heard of the parable about the boiling frog. 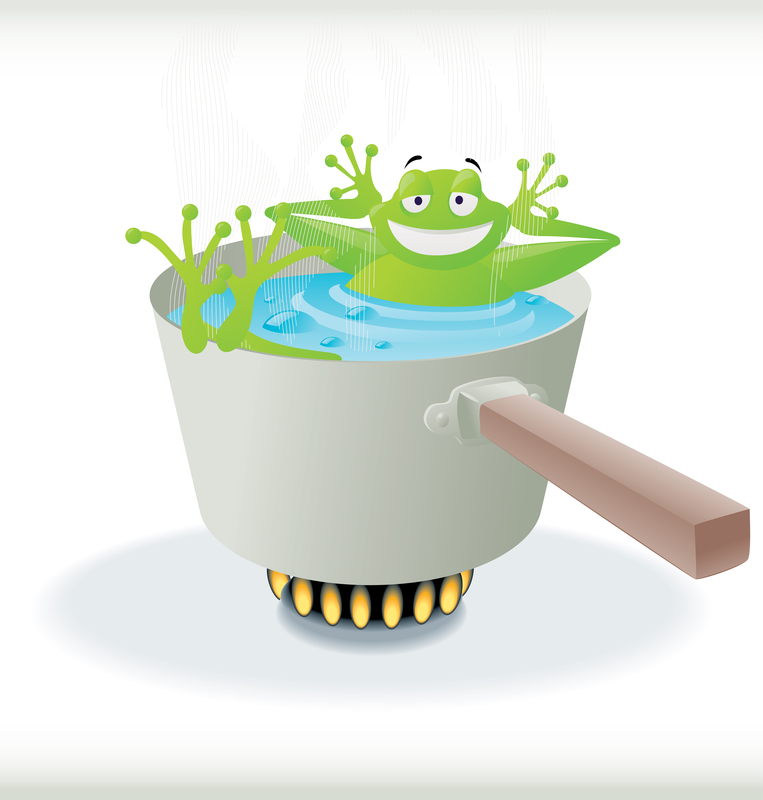 The premise is that if you place a frog in a pot of boiling water, it will jump out. However, if it is placed in cold water that is slowly heated, it will not perceive the danger until it is too late – it is cooked to death. This parable illustrates how people should make themselves aware of gradual change before they suffer the catastrophic consequences. So it goes with health insurance premiums (and our health care ‘system’). This “boiling frog syndrome” can also be found right here in Iowa. Based on the results from our 2011 Iowa Employer Benefits Study©, we found that the average annual family premium paid jointly by both the employer and employee was $13,295! An astounding number! As concerning as our premiums are in Iowa, they appear tame compared to what they potentially will become in the next ten years. Based on our annual studies, the average premium increase reported by Iowa employers during the last five years was 10.2 percent (prior to making plan design changes to bring their rate increases down). 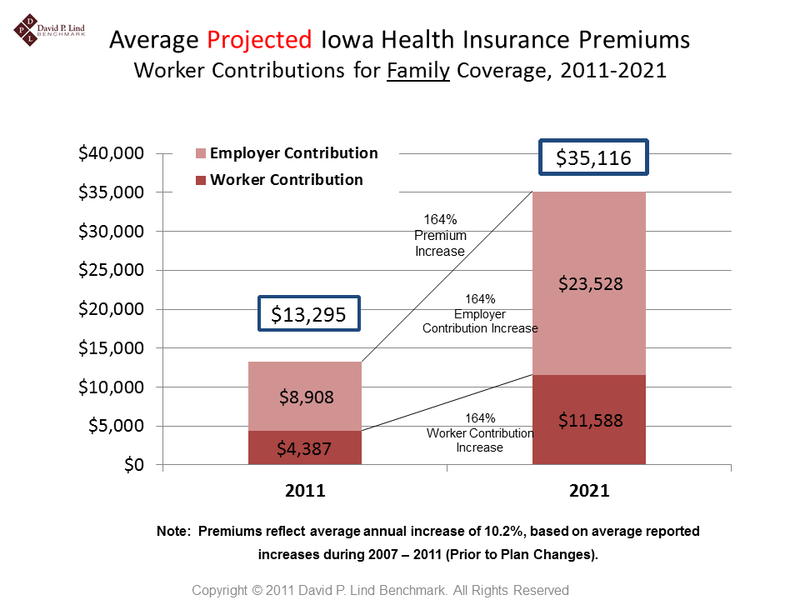 If we trend the Iowa family premium by 10.2 percent annually for the next ten years, the $13,295 premium now becomes (drum roll, please), about $35,000 (or 164 percent higher than today)! Again, we assume that the employer has not made changes to their health plans during the next ten years, which is HIGHLY unlikely. Quite obviously, Iowa employees will see their take-home pay become severely suppressed. In 2011, the average Iowa household income was approximately $50K, which means the family premium was 27 percent of the income earned by the average Iowan. In 2021 (assuming that income increases an anemic 2 percent annually for the next ten years) the family premium would be almost 60 percent of household income! This truly defines the word, “unsustainable”. Health reform in this country, however it looks, will need to aggressively address the cost issue – as it remains to be seen how successful the existing health reform law will do this. Like the frog, we are slowly being cooked. We need to find a way to jump out of that simmering pan of water before it becomes too late. The Supreme Court has ruled on the constitutionality of the health reform law. Now what? Iowa employers, insurance carriers, health care providers (among others) need to continue the implementation process required under this law. So does the state of Iowa. For example, will Iowa have its’ own insurance exchange for individuals and small businesses, or will it need to defer to a federal-based exchange? At this point, we don’t really know. We do know that if Iowa wishes to operate a state-based exchange on January 1, 2014, it must submit a completed Exchange Blueprint to the HHS no later than November 16, 2012. 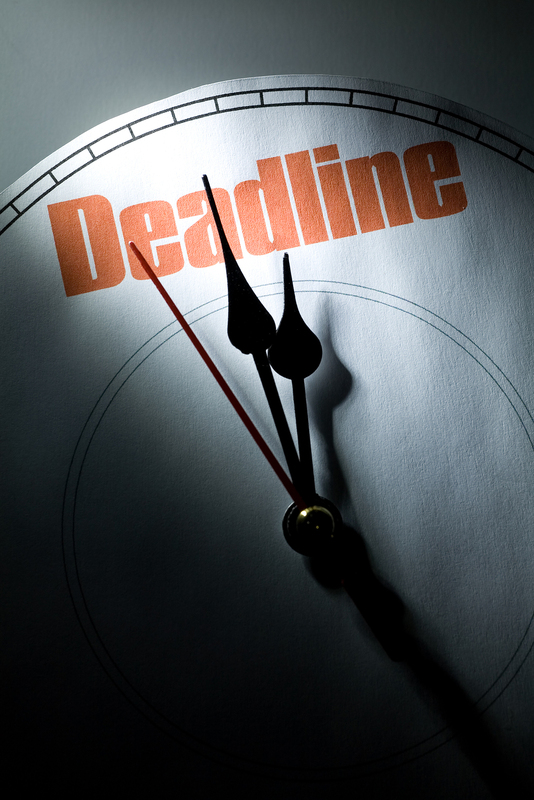 This notification deadline will be shortly after the national elections…hmmm. To date, the Iowa legislature has not passed legislation to approve its’ own exchange, which is an important part of the process. However, without such legislation, the Governor may issue an Executive Order to establish the exchange. Whether this will happen…and if so, when, is uncertain at this time. Whether insurance companies in Iowa participating in the exchange should be required to offer all health plans sold in the exchange to individuals or small employers purchasing coverage outside the exchange. Whether the individual and small employer markets should be placed entirely inside the exchange. Whether the individual and small employer markets should be standardized inside the exchange or inside and outside the exchange. Whether to increase the size of small employers from an average of at least one but not more than 50 employees to an average of at least one but not more than 100 employees prior to January 1, 2016. How to account for sole proprietors in defining “small employers”. There are a host of other key (and complicated) questions that Iowa and all other states must decide before pursuing their own insurance exchange. Needless to say, there will be heavy lifting by key stakeholders prior to November 16 of this year. Will Iowa be ready? You hear this phrase from many different sources. It conjures up something within us that we all desire to have when making critical decisions. Understanding the pros and cons on any given issue is important to most of us. But do we really receive the “truth” or the “transparency” that will allow us to draw our own conclusions on the subject matter at hand? It really depends on the source of the information…so I believe. The reason for this particular blog stems from a presentation that I recently gave at the “2012 Iowa Employment Conference” in Altoona. Much of my presentation focused on the health insurance trends in Iowa based on our annual studies. The trends by the way, are dismal at best, unsustainable at worst (another blog for later). When discussing potential solutions for employers, a few topics were breached such as consumer-driven health plans, wellness initiatives, and health reform measures. I mentioned that each topic will usually have many arguments (both pro and con), in addition to having both intended and unintended consequences. To know the subject matter well, I suggested to the audience to have a comfort level with their SOURCE of information (publications, media outlets, research organizations, etc.). Much to my surprise, a hand was raised that followed with this question: “Which sources do YOU trust?” This question came out of the blue for me, but was asked in a thoughtful manner. I don’t quite remember my response that day, but since that presentation, I have had time to further reflect on this question. The word ‘Trust’ is defined in the Merriam-Webster dictionary as “assured reliance on the character, ability, strength, or truth of someone or something.” Another definition is “one in which confidence is placed.” I like both. Regarding health care related stuff (including health insurance programs offered by employers), I TRUST a few particular sources. Each source has earned my trust over the years due to consistent research that attempts to factor out biases that typically are inherent in any type of research. Also, the authors of such research will generally disclose any potential outside influences that may mitigate the truthfulness of the results. Health Affairs Journal – Many authors (national and international experts) write thought-provoking articles on highly researched thematic topics each month. This is the gold standard because the information is fresh and relevant at all times. I also download their free podcasts and listen to them while I run in the morning. A subscription is necessary for this journal…but it is well worth the investment. RAND Corporation – RAND provides objective research on many issues, including healthcare. Rand provides very innovative material…much of it can be found on their website at no cost! Kaiser Family Foundation – Most information is at no cost…and there is a ton of information on many different health topics. A great go-to source! Dartmouth Atlas of Health Care – The pioneer on the disparity of health care delivery in the U.S. There are other sources that I highly value, but those sources (at least in my view) tend to be a level below the four mentioned above. Just know that the SOURCE of information is just as important as the content of the information being conveyed. 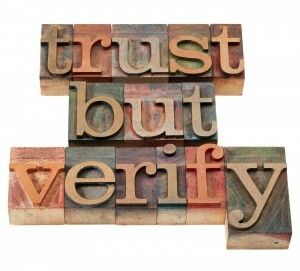 President Reagan adopted a signature phrase and made famous when discussing U.S. relations with the Soviet Union: “Trust, but verify.” This phrase can also be applied to healthcare information and many other topics!